What are you going to do with all those tomatoes in your garden? 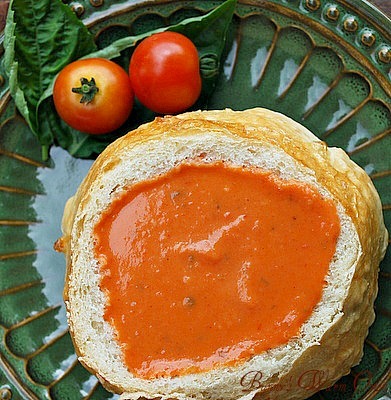 I have an idea…let’s make a rich ,creamy hearty, homemade tomato soup with lots of flavor.When I made the Italian Bread Bowls I told you I’d show you a recipe you could use them with. The Heirloom Tomato Soup recipe is a perfect way to do that. I didn’t garnish the soup other than on the side of the plate because I wanted both the soup and the bread bowls to be visible to you. The first time I made this soup was last fall when the weather was turning brisk. I made it with tomatoes that I had frozen in the summer. When my husband tasted it, he said it was a tomato soup that you would get in a five star restaurant. I made it again today with fresh tomatoes, it was lovely and full of flavor. I took my fresh tomatoes and blanched them for about 30 seconds in boiling water,and then put them in cold water to cool. The tomato skins peel right off of the tomatoes. You can do this to a peach as well to remove it’s skin. I cut all the blemishes off the tomatoes, and cut them into quarters. Using my fingers, I got into the chambers of the tomatoes and removed the seeds. They push right out. Put the tomatoes and all the spices and herbs, including the bouillon cubes into the bowl of a food processor and give it a whirl . Process until everything is smooth. Can you see the spices and herbs in there, it’s going to be delicious. Now we’re going to make a roux. Melt the butter in a saucepan and whisk in the flour. I always let it boil a minute, it takes the flour taste out of it. Next add the milk, and cook and whisk until it comes up to a boil. Add the tomatoes. Heat the soup back up to hot and tweak it to your liking. If it’s to thick , add some milk, if you want more herbs or spices, add them. If your tomatoes don’t have the tomato flavor you hoped for, add a little tomato paste to the soup. This soup is delicious with or without a bread bowl. If you’re using frozen tomatoes, this recipe comes together from start to finish in about 20 minutes. If you prepare your fresh tomatoes ahead of time and make the soup, you’re still only looking at 20 minutes. This is a delicious, creamy, rich , flavorful soup that you will love. Enjoy! Blanch your fresh tomatoes in boiling water for 30 seconds. Place the warm tomatoes in cold water to cool. Peel the skins off the tomatoes and cut any blemishes off. Cut the tomatoes into quarters and remove the seeds. Put the tomatoes and all the spices and herbs, including the bouillon cubes into the bowl of a food processor and give it a whirl until mixture is smooth. 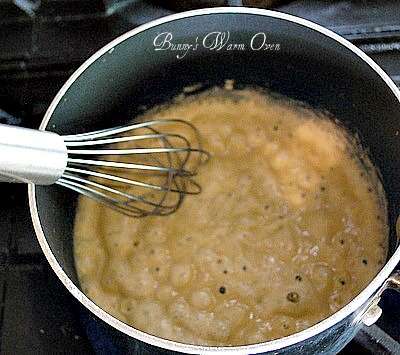 Melt the butter in a saucepan and whisk in the flour. I always let it boil a minute, it takes the flour taste out of it. Next add the milk to the pot. Cook and whisk until it comes up to a boil, add in the tomatoes. Heat the soup back up after the tomatoes are added and tweak the soup to your liking. if it's to thick , add some milk, if you want more herbs or spices, add them. 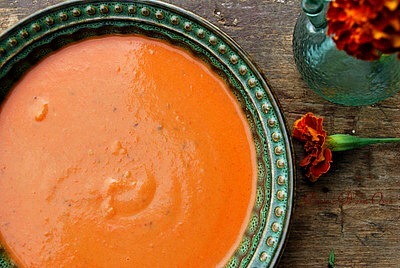 If your tomatoes don't have the tomato flavor you hoped for, add a little tomato paste to the soup. 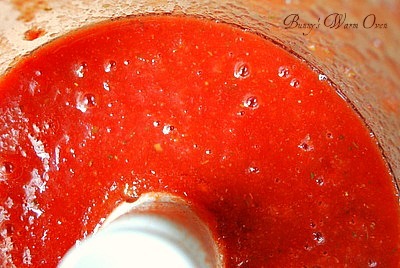 If you are using frozen tomatoes....thaw the tomatoes completely and continue with the recipe. I want a bowl of that now! Looks amazing! Your photons are Beautiful! When in a hurry I freeze tomatoes. Blanceand let the a little till u can pull them apart to remove seeds. Eva, thank you! I’ll have to start freezing them that way! Hi Sprouts! I used chicken bouillon cubes, 4 of them. Sure you could add vego stock! I would wait till the soup is done, and add it then. Taste to see if you need more. This recipe brought back memories of a winery in Napa that made a delish #tomato #Soup. #Heirlooms are so flavorful, I’ll be this is amazing. I’m going to try the bread bowl for this and for a Spinach Dip I make! Thanks Mary!! KC I’m so happy it brought back a wonderful memory for you! And those bread bowls will be perfect with the spinach dip! WOWSA! This is a beauty, Bunny. And sounds so incredibly delish! Congrats on your home run with this one!! Sounds wonderful! Especially in the bread bowl!